When a racehorse achieves his first victory, he leaves the "maiden" ranks forever. He will never again race against horses that have not already won a race. The first attempt to conquer proven winners is a learning experience, and, for promising colts, a developmental stepping-stone. For the average colt, and many above-average colts, it is a daunting task that will typically result in defeat. But for the greatest colt to ever set foot on a track, it was simply another challenge to brush aside with a stroke of genius. Seattle Slew had displayed his brilliance while winning his maiden race some fifteen days earlier under a restraining ride by jockey Jean Cruguet. There was further confirmation of his quality when four of the eleven horses that finished behind him that day came back to win their next start. Although his debut contained an amazing display of speed and power, it is only natural that the racing fraternity required more proof. On Tuesday, October 5, at Belmont Park in New York, Seattle Slew was entered in a seven-furlong non-winner of two races allowance event. The post position draw gave Slew the worst possible scenario. He drew the number 1 slot on a Belmont track that was notoriously unkind to runners on the rail in 1976. In fact, it was such a disadvantage that trainer Billy Turner and the Slew Crew would most likely have scratched their eventual champion except for the fact that the Champagne Stakes was eleven days away and he needed this race to be ready for that prestigious event. It was unheard of to run in the most important stakes in the world for two-year-olds after completing just two races. Imagine the astonishment if Slew had won the Champagne Stakes off just a maiden victory? Naturally, Slew was the horse that could've done it. But his connections wisely decided it was necessary to get this race under his belt. 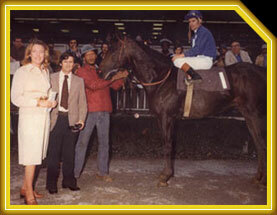 This would prove to be the only race of Seattle Slew's career that owners Karen and Mickey Taylor did not attend. Mickey was still an active lumberman at the time. Two important timber sales were held in the Pacific Northwest on the day of the race that the Taylors needed to attend. In their absence a strange and little-known occurrence happened regarding Karen Taylor's racing silks. The New York Racing Association misplaced the silks that would ultimately be made famous by Seattle Slew. Somehow, NYRA could not find the silks and Slew was forced to run with the "house" silks, a solid blue color with a black "X" on the back. "I still can't believe that happened," said Mickey Taylor. "Here was a colt that was a very impressive maiden winner and the NYRA misplaced the silks. It certainly wouldn't have happened if we were there." Slew was facing a field of useful colts including Cruise On In, Lancer's Pride, First Pretense, and Indian Quail. When the gates opened, Slew broke very poorly and was trailing the field, some four lengths behind Cruise On In. He then displayed his ferocious speed and competitiveness, rushing up along the rail to gain a length advantage by the time an eighth of a mile had been run. Cruise On In and First Pretense were giving a good effort and staying close along the backstretch and into the turn. On the far turn Indian Quail made a move, advancing past horses and Lancer's Pride moved up. But The Slew just took over and dominated the race at will, winning the race by 3 and ½ lengths "handily," as described by the Daily Racing Form. Cruguet sat as still as a statue, hand-riding throughout, except for an occasional look over his shoulder to gauge the possibility of a challenge from behind. The fractions were all Slew's and they were recorded as :22 3/5, :45 4/5, and the final time of 1:22 for seven furlongs. Cruise On In would finish second in a good effort, and Lancer's Pride took third. Another astonishing part of Slew's second victory came when Cruguet rode him out an extra furlong in preparation for the Champagne Stakes. Seattle Slew was ridden out a mile in 1:35 1/5, a time that would have been fast enough to win eight out of the previous twelve Champagne races. Incidentally, he was pulled up 1 1/8 miles in an incredible 1:50. On July 25, 2003, Mickey Taylor spoke about Slew's impressive performance the second time he ever went to the post. "Well, we knew he was a heck of a runner ever since July when he had gone a half-mile in :44 flat while the exercise rider was restraining him with all his might," he recalled. "This is a maiden two-year-old we're talking about here. But how can you really comprehend that he could turn out to be as great as he did? Regarding this race, we weren't happy that we couldn't be there but we were elated when we found out that he had run so well. We were in my pickup truck on the way back to White Swan when Billy (Turner) called and said Slew's race was amazing. It was an unbelievable performance that is very underrated and not really even known by most people." Indeed, the way that Seattle Slew handled his horrendous break from the gate and the tiring rail path made a believer of Hall of Fame trainer LeRoy Jolley. After this race, Jolley approached Karen and Mickey about the possibility of purchasing Slew. Of course, they turned down his handsome offer. Even after Seattle Slew had impressively won the Flamingo Stakes in the spring of 1977, Jolley was still talking about his performance on October 5, 1976. "Sure the Flamingo was a big race," Jolley said at the time, "but to me the biggest race he ever ran was the non-winners of two allowance. "The inside at Belmont is impossible. Nobody wins cutting the corner, not on any level. I only remember two horses winning on the inside at Belmont the whole year. One was Elliott Burch's filly, Ivory Wand, and she did it twice-which shows you what kind of runner she is. The other one was Seattle Slew. "He had the No. 1 box to begin with, and then he got flat left (at the break). All he did was make the lead, on the inside, in an eighth-mile, and go right on to win easily. He never left the rail. I didn't see a more impressive performance all year." "It was a very big race," he said. "He overcame some problems, and did it easily." Now the Champagne Stakes was on the minds of the Slew Crew. There were many quality colts to consider including For The Moment, Run Dusty Run, Sanhedrin, Royal Ski, and Clev Er Tell. But to Seattle Slew, the world was his oyster. His extreme determination and advanced mentality had already convinced his own psyche that no horse on earth could run with him.